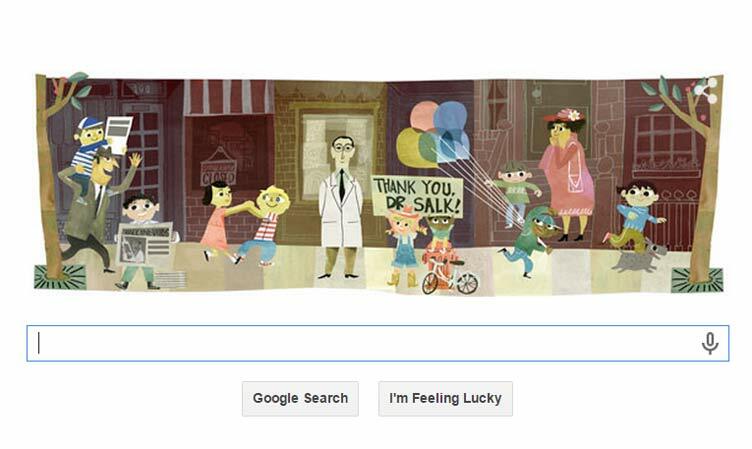 Yesterday, Google celebrated the 100th birthday of Jonas Salk, the man behind the polio vaccine, by running the American researcher’s doodle on its search page. Salk graduated from New York University School of Medicine in 1939 with his MD degree, and soon started work as a staff physician at Mount Sinai Hospital in New York City. In 1942, the virologist joined a team working on a vaccine against polio at the University of Michigan School. Later, he went on to head the Virus Research Lab at the University of Pittsburgh and by 1952, he began preliminary testing of the polio vaccine. Salk was able to discover three different polio viruses, which eventually helped him develop a virus vaccine to fight the disease. In a bid to achieve the desired goal, Salk first grew and then destroyed polio viruses. According to experts, the field trial for testing the polio vaccine had involved 20,000 health workers and more than 1,800,000 school children. On April 12, 1955, the polio vaccine was declared a success. Salk is also regarded as the ‘Father of Biophilosophy’ as he chose not to patent the vaccine. He did not make any money from his finding, preferring to see the vaccine being distributed as widely as possible. The legend passed away at the age of 80 on June 23, 1995. On March 27, 2014, India was officially certified polio-free by the World Health Organisation (WHO) after three years without reporting a single new case. The eradication of polio in India is heralded as one of the biggest achievements in global health efforts.